What is a modern, 21st-century woman’s first step of action if she is unclear about how to use an ingredient? Of course, she asks the omniscient internet for advice. And let me tell you, the advice was good. 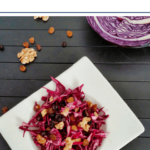 I came across this recipe for red cabbage salad on Slate.com and I have never looked back. The original recipe recommends blue cheese as a topping but so far, I haven’t been brave enough to even buy it. Hence, my recommendation is making this recipe without the cheese. But if you would really like to up the protein in this crunchy and delightful salad – and aren’t too crazy about blue cheese either – then feta cheese is a great option. You can easily turn this recipe into a salad in a jar: Add a quarter of the dressing ingredients to four 16-oz, wide-mouth mason jars. Now add the raisins and walnuts before filling up the jar with shredded red cabbage. If you like, top with blue cheese or feta. Now you have a quick grab-n-go lunch sitting in your fridge, ready to take to work. Just shake it vigorously for a minute to mix up the ingredients and lunch is served. This beautiful salad with its vibrant colors keeps really well for quite a few days, even when mixed with the dressing. My husband feels it actually gets better after a few days. Therefore, you might as well mix up a big batch (minus the optional cheese) and then divide it up between your jars. Add the cheese as a separate topping to extend its life in the fridge. If your food processor comes with a blade for thin slices, you save a lot of time by shredding the entire cabbage in one go. Packed into resealable freezer bags, this shredded cabbage will keep for a number of days and is super handy to have around. You can whip up a single portion of this crisp and delightful salad, or just add a handful of the colorful shreds to any other salad you prepare. There are, however, seasons in life when there’s no energy left for that sort of undertaking. In this case, buy pre-shredded red cabbage and enjoy the fact that someone else made a living by shredding it for you. 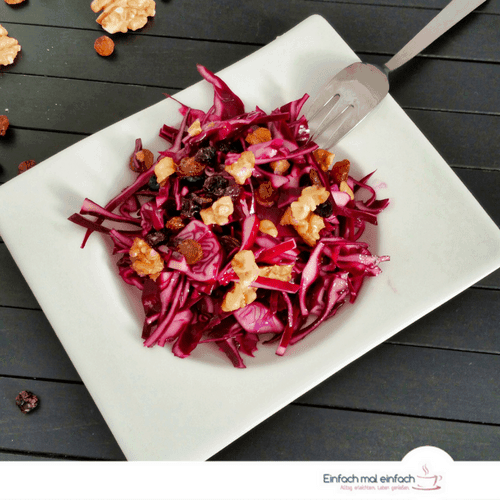 Either way, if you are looking for a break from your regular side dishes and good old green salads, go ahead and give this beautiful salad a shot. I promise you won’t regret it. A quick and easy salad recipe that can be made in a manner of minutes, so flavourful and crunchy that you'll keep coming back for more. Shred cabbage in wedges, using either a mandolin or the slicer attachment of your food processor. If you have neither, cut cabbage into fine strips, using a sharp knife. Add to a large bowl. 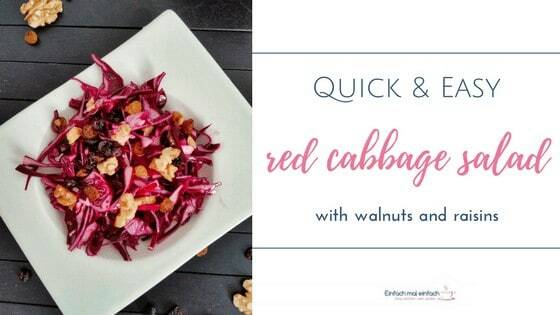 Lightly toast your walnuts in a hot pan, then chop and add to red cabbage along with raisins, balsamic vinegar and olive oil. Then mix with a large spoon. Add salt and pepper according to your taste and preferences - we're not big on pepper so the amount above is on the cautious side. Definitely add more if you love the flavour! 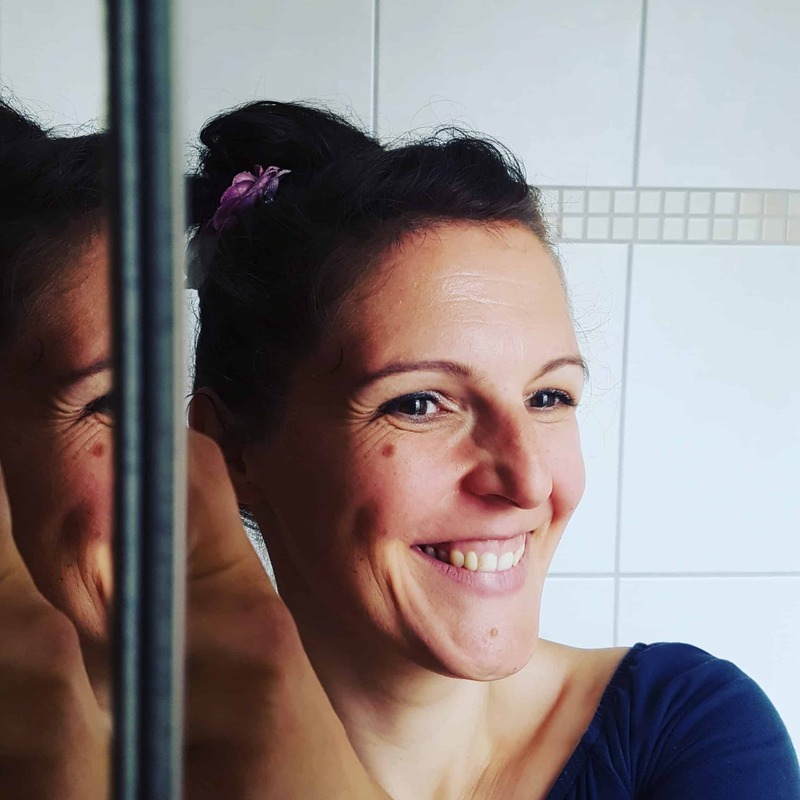 Serve and enjoy - even better the next day! If you like it, add 1-2 oz of blue cheese or feta for added protein. I recommend not mixing it right into the salad, though, if you want to keep it in the fridge for a few days. Instead, serve the cheese as a topping. 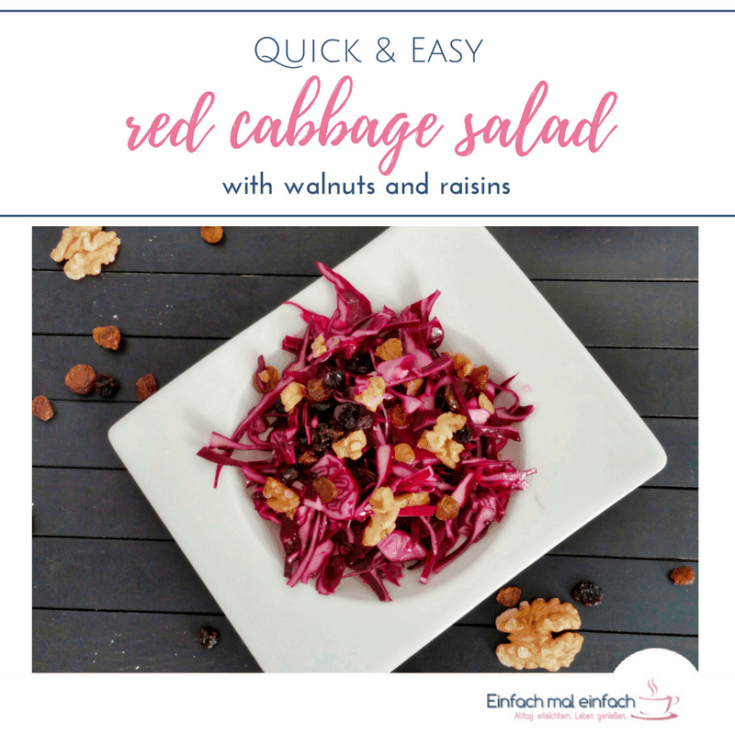 If it's a rather big head of cabbage, feel free to add more walnuts and raisins. 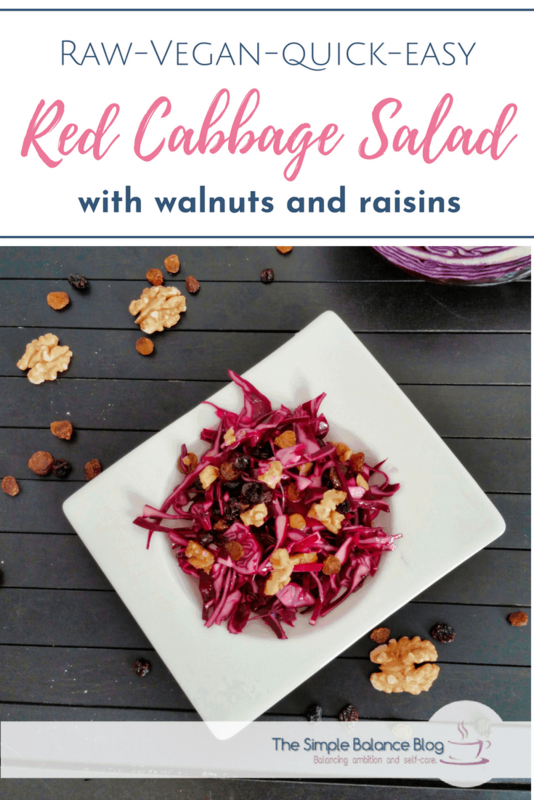 If you love the flavour of walnuts and raisins, I suggest doing so either way... 😉 *Toasting the walnuts adds great flavour, however, if you are short on time or energy, feel free to omit this step. It still tastes great with untoasted walnuts!